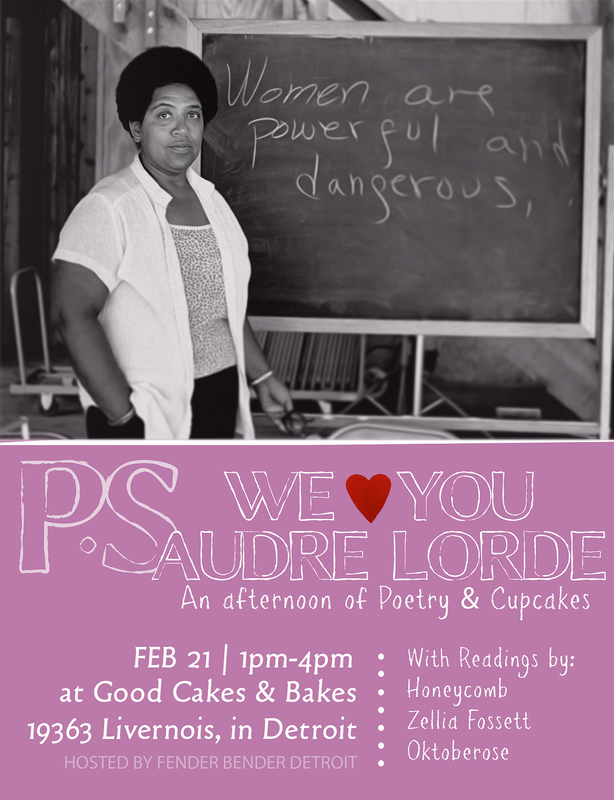 Join FBD in our second annual celebration of Audre Lorde’s birth and life! We’ll honor Audre’s legacy and build new visions for change with poetry, cupcakes and community and hear readings from amazing Detroit poets Honeycomb, Zellia Fosset, and Oktoberose. We will have several of her books and works to be shared during the afternoon, and welcome you to bring your own. Audre Lorde BINGO kicks off the event at 1 o’clock, followed by an invocation + welcoming. The bakery will be open for refreshments, in addition to a donation wine bar. Audre Lorde described herself as a “black lesbian mother warrior poet” and dedicated her life and creative work to confronting the injustices of racism, sexism, and homophobia. Audre urged us to speak truth, and that our truths, our lived experiences, and our deepest visions are the source of our greatest power. Please invite friends, family, and loved ones!